This category covers widths of either 360mm through to 1500mm. 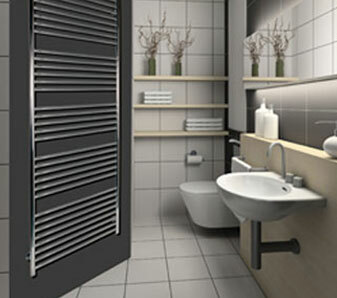 This elegant flat range of stainless steel towel radiators covers a wide range of requirements. All are available in polished or coloured finishes, all with dual fuel and full electric options. 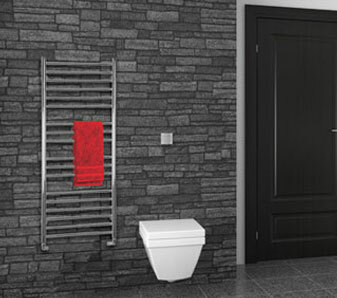 You can complement this range with matching round tube grab bars to complete the effect. Also, consider products from our Zack range in a polished mirror finished such as the Scala design of bathroom accessories. All our radiators are manufactured in compliance with EN442 standards and tested here in the UK. The construction products directive gives manufacturers a legal duty to CE mark their products in compliance with this standard. This legislation also requires the heat output to be declared as Delta T50. Please ensure the comparable products you consider advertise T50, not T60 which will incorrectly inflate the actual heat output you could expect. Why are we different? - A few tips before your spend on cheap and cheerful.